← Thank you Bio Oil! If you’re after super glossy, sleek hair this is a great find that will transform frizzy hair into smooth. Whether your dryness is caused by colouring it or just by the general damage caused by the sun or the cold weather, this styling cream will add a silky finish to it. To use, you just need to apply a coin size of product and run it through your hair, concentrating on the areas you’re concerned about. It will add moisture to it, giving it that groomed look that is so ‘right-now’. It’s soft to the touch and feels as if it’s melting into your hair! You can also blow dry the hair after using this product, which will give an ever more dramatic finish to it. The products is a lightweight blend of humectants (does not contain waxes or emulsifiers) and it works by penetrating into brittle hair to replace natural oils lost during chemical treatments, blow-drying and daily stress. It’s a quick, easy and very effective treatment so add it to your Christmas list to ensure your hair is looking healthy and shiny for the holidays. 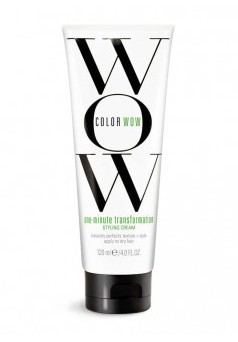 Like the rest of the WOW products you’ll love its fresh smell and silky texture, as you run it through your hair. One minute transformation miracle styling cream, is priced at £9 and available at QVC and colorwowhair.com. This entry was posted in Haircare and tagged dry hair, finishing touches, frizz, stressed hair, WOW. Bookmark the permalink.